Location: Épinay-Champlâtreux, in the Val-d'Oise departement of France (Ile-de-France Region). Notes: Château de Champlâtreux was built between 1751 and 1757 by the architect Jean-Michel Chevotet. 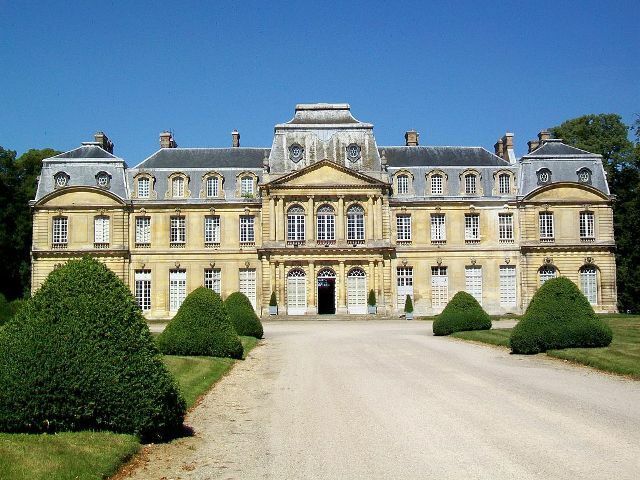 Located Epinay Champlâtreux (Val-d'Oise), he was the country residence of the Mole family, illustrious family of Parisian parliamentarians and belongs to the family of Noailles since the nineteenth century. The castle, built with all its parts and its park, was a historical monument by decree of 9 March 1989. The French gardens designed by Chevotet were replaced in 1823 by an English landscaped park designed by the brothers Thouin . Partial refunds made since 1930, however, allowed to find the design of the forecourt of the main avenue leading to the castle and part of the gardens to the west. Here opens a vast perspective on wood Champlâtreux, with a small round pool in the center. Details of the French garden have disappeared, but the cypress trees planted around the old beds allow to guess the outline. In the north, the English garden is fairly intact.